Slowly but steadily the Kashmir region under Pakistan authorities becomes a happening place for anti-Pak activities, where the protesters come with clear voices against the Pakistan government in Islamabad in repeated times. Most recent one on November 18, 2018 was at Bagh, where the activists bluntly asked Pakistan to end its illegal occupation over Kashmir. For reasons best known to nearly 4.5 million residents of Pakistan-occupied/ controlled/ administered Kashmir (PoK), they have started raising voices against Islamabad. It may (or may not) be affect the Narendra Modi government in New Delhi, a known political enemy to Islamabad, but the hilly region has started witnessing repeated anti-Pak activities in the recent past. Otherwise, for millions of common Indians, the PoK looks like a province of Pakistan. They presume that the residents of PoK (called Azad Jammu & Kashmir or AJK by Islamabad) happily follow any direction from the Islamic Republic because of their proximity to the religion. PoK has no visible Hindu, Buddhist, Sikh or Christian population. Slowly the myth has started losing its ground. Many recent protest-demonstrations in PoK’s capital city of Muzaffarabad along with few other towns against Islamabad have shown the growing anxieties of the locals. The PoK media, mostly in Urdu language, highlights the people’s angers against the Islamabad regime, even the Pakistan’s mainstream media continues preferring to ignore those demonstrations. The latest demonstration, organized by the United Kashmir People's National Party (UKPNP), at Bagh locality of PoK, reflected concerns of the participants over environmental issues. They unanimously protested against the construction of dams and other projects in PoK and also in Gilgit-Baltistan region. The protest rally ended in demanding freedom from forceful & illegal occupation of Pakistan in both the regions. Some demands, raised by the protesters through slogans and banners, included preventing the intervention over Neelum-Jhelum river (also known as Kishan Ganga) in PoK, construction of Diamer-Bhasha dam in Gilgit-Baltistan, functioning of China-Pakistan Economic Corridor (CPEC) project, under which a bus service connecting Lahore with Kashgar in western China through Khunjerab Pass has already been launched. Earlier on October 25, exiled political activists from PoK and Gilgit-Baltistan demonstrated in front of the European Parliament in Brussels protesting against the misuse of natural resources in their homelands and continued brutalities over locals by the Pakistani military personnel. It was predeceased by a series of protests in Muzaffarabad, Rawalakot, Kotli, Gilgit, Rawalpindi etc on October 22 as a black day. One may recall here that Pak military personnel, who dressed as tribal people invaded Jammu & Kashmir on October 22, 1947. The invaders massacred local Kashmiri people, destroyed properties and even abused the women. After occupying large parts of northern Jammu & Kashmir, they approached Srinagar. With no options left, the then king of Jammu & Kashmir, Maharaj Hari Singh, asked for India’s help. Accordingly, the king signed an agreement with New Delhi on October 26 and later Indian forces entered into Kashmir. But Gilgit-Baltistan and PoK remained under the occupation of Pakistan. Recently, a section of PoK residents in Kotli town demonstrated against the government in Muzaffarabad demanding proper medical care in the hospitals. Similarly, many people in Bagh urged the authority for improving the education scenario. In the first look, it may emerge as a protest against the local government, but in reality, the grievances were meant for Islamabad. It may be noted that Kashmir, which went under British rule in 1846 and later turned as a semi-independent pristine state till 1947, was later divided into four segments. The major part remains with India as Jammu & Kashmir province. The northeastern part went under the occupation of Beijing (known as Aksai Chin). The northern region was made a semi province Gilgit-Baltistan by the Pakistan government, which Islamabad is now thinking to reorganize as a full- fledged province of Pakistan after Balochistan, Khyber-Pakhtunkhwa, Punjab and Sindh. The western part remains as Pakistan administered zone, which it calls Azad Jammu & Kashmir (AJK). Officially it has an elected and functioning President (presently Sardar Masood Khan), Prime Minister (presently Raja Farooq Haider), a Legislative Assembly and even a Supreme Court. However, the actual political-economy rests with Kashmir Affairs minister in the cabinet of Pakistan Prime Minister (presently Imran Khan). Demonstrators in PoK always raise voices against the Pak government, even though it is not represented in Pakistan's National Assembly. Though initiated with various reasons including protests against the hydroelectric dam over Neelum river, shrinking of job opportunities and anti-people activities by both state and non-state actors, the inherent demands always remain the freedom from Islamabad. 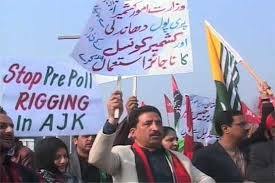 For records, the UKPNP called October 5 protest in Muzaffarabad to raise voices against the Neelum dam, but their slogans also included ‘Azadi for Kashmiri People’, ‘Long Live Kashmir’, ‘Go to Hell Pakistan’ etc. A number of protest-demonstrations in September across PoK expressed angers against Islamabad for misusing their local resources. Similar protests were also orchestrated in Geneva (in front of UNHRC) and London (in front of Pakistan High Commission), where the participants demanded genuine freedom and dignity for PoK and Gilgit-Baltistan residences. In the presence of many Sindhi and Baloch political activists in those programs, the agitators chanted slogans like ‘Stop Human Rights Violations in PoK and Gilgit-Baltistan’, ‘Save Neelum to Save Muzaffarabad’ etc. Even massive protests were observed at Rawalkot locality in July raising voices against Islamabad’s aids to anti-India terror activities in PoK. The protesters accused various Pak authorities (including ISI) of providing supports to terror outfits like Jaish-e-Mohammed, Lashkar-e-Taiba, Hizbul Mujahideen etc. So the ongoing freedom movement in Kashmir got derailed as the international community started believing that the movement had mingled with Islamist terrorism. When faced international pressures to crack down terror groups, the Islamabad regime often uses PoK as a safe haven for the terrorists. Admitting the presence of Islamist fundamentalist elements in PoK, a Muzaffarabad based journalist (Haris Qadeer), who used to edit once the highest circulated Urdu newspaper Daily Mujadala, pointed out that the growth of radical elements and terrorism had affected local aspirations for a greater Kashmir. Qadeer, who talked to a group of journalists at Guwahati Press Club in northeast India through video-conferencing recently, commented that in contrast to commonly-held belief in India, the people of PoK are neither in favour of Islamabad nor in support of New Delhi. Rather they prefer to identify themselves as Kashmiri first, asserted the young editor. Answering queries from Guwahati scribes about any visible change of perception after legendary cricketer Imran Khan accepted the helm of affairs in Islamabad, the young journalist commented that it is too early to get the impression and comment. Qadeer however stated that the PoK residents would have little expectation from the new regime of Pakistan. Talking about the communication in PoK, the editor disclosed that there is still no train connectivity and presently no operational airport as those are being occupied by the Pakistani militaries. So the PoK people have to move to Islamabad (around 90 km from Muzaffarabad) or Rawalpindi (138 km) by road before they can proceed to other places (including foreign countries). As the healthcare infrastructure in PoK is poor, the affluent families prefer to move out for treatments. Many patients with liver ailments want to go to various hospitals in India, but there are restrictions from the Pakistan government, revealed Qadeer adding that Islamabad also put prohibitions for Indian tourists to visit PoK, which has very little non-Muslim population. Qadeer did not bow down, the local authorities sealed his office on September 12, 2017. As the ban still continues, Qadeer now contributes news-features for various other media outlets for survival. He does not see any hope for change of hearts by the Pak politicians and military officials in Rawalpindi very soon. Notably, most of the issues concerning PoK residents are not highlighted in the media as their vernacular newspapers remain week and majority of newspapers, circulated in PoK, are actually Kashmir editions of various Pakistan based media outlets. As for news channels, which are mostly cable operated, there is almost zero visibility of any India based news channel in PoK. So it is understood that only few PoK residents might have heard about New Delhi’s strong position as the entire Kashmir inclusive of PoK, Gilgit-Baltistan and Aksai Chin is an integral part of India. That is why there is possibility that they are not aware of India’s strong opposition to the USD 50 billion CPEC project involving many parts of Kashmir. But refreshing news for India would be that aspiring youths of PoK and Gilgit-Baltistan now prefer to study in various educational institutions across the country. They even start pursuing reservations in IIMs, IITs, various medical, agriculture, law universities for the students of PoK and Gilgit-Baltistan. Taking the help of social media, those aspiring students recently appealed to New Delhi and Indian populace for not ignoring their future.